The Goodyear Innovation Center in Luxembourg. Image courtesy of Goodyear. The four-year research project has the potential to initiate major innovations in the automotive sector. It is funded by the Luxembourg National Research Fund (FNR) and Goodyear. Near-Field communication is poised to fundamentally change the automotive sector. “NFC is a form of short-range wireless communication that relies on electric and magnetic fields generated around a transmitting antenna. This communication technology is now being explored for automotive applications due to its unique characteristics,” explains Ahmad Rida Tawakuli, PhD student within the Security and Networking Laboratory (SECAN-Lab) at the University, who initiated the project. This research project addresses the advantages of using near-field based automotive systems in applications where currently prevailing Radio Frequency Identification (RFID) based systems cannot function properly and proposes a tire identification and diagnostic system for use in vehicle fleets. The project will research the potential of near-field technology to replace wire- or RFID-based communication in certain vehicles, providing the driver and possibly the fleet administrator with tire data. “The system will contribute to road safety and the reduction of accidents by providing crucial real-time information about tires,” explains Derek Shuttleworth, Manager of External Science and Technology at Goodyear. “This is a first step towards new automotive applications, and Luxembourg could become the hub for near-field communication research in Europe,” adds Ahmad Rida Tawakuli. 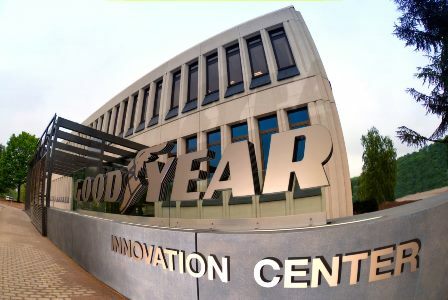 “With the support of the FNR, the University of Luxembourg and Goodyear are enhancing their collaboration for safe and sustainable transportation research in Luxembourg. This project will enable us to develop our expertise in near-field communication in cooperation with one of the world’s leading manufacturers of tires. This demonstrates our research excellence and our central positioning in the national industrial landscape,“ says Prof. Stéphane Pallage, Rector of the University of Luxembourg. Created in 2005 as a common research group of the Computer Science and Communications Research Unit (CSC) and the Interdisciplinary Centre for Security, Reliability and Trust (SnT), SECAN-Lab conducts internationally competitive fundamental and applied research on privacy-friendly secure intelligent transport systems, vehicular communication and multimodal traffic management, the Internet of Things, network, system security and cybersecurity. “We develop new architectures and communication paradigms for wireless communication, meeting the challenges posed by the future Internet to cover the entire spectrum of possible applications that will emerge in the short and long term”, says Prof. Thomas Engel, Head of SECAN-Lab.